When the Dark Knight needs a small but helping hand defending Gotham from evil-doers like Harley Quinn, Killer Croc, and The Joker, there is only one person he never hesitates to call! 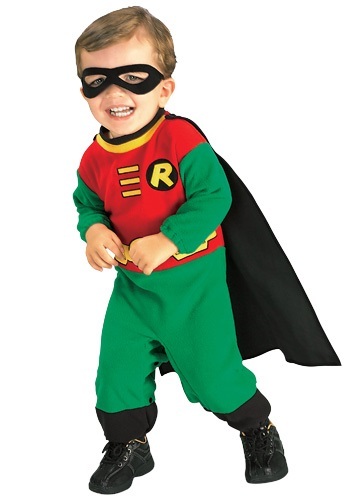 Let your little one become a boy wonder in this Infant Robin Costume. Robin, verifiably the greatest sidekick ever, is ready for a night of fighting crime. No evil can stifle his ambition of making sure every supervillain is locked safely behind bars and the residents of Gotham can stroll the streets with peace of mind. When he isn't joining forces with Batman, Batgirl, or the Teen Titans for some grand goal, he patrols the streets on his own—but only before bedtime! When he isn't saving Gotham, word on the street is that this boy wonder can be found going door-to-door asking for candy, and that's okay. We always thought the trick-or-treating crowd could use a little extra assurance that their haul of sweet treats—buckets, bags, pillowcases and all—will make it back home without so much as a broken wrapper. If your little one is up for the task, plop him in this comfy fleece romper, snap on the aerodynamics-improving cape, and he'll be the cutest hero around! Note: we are not liable for increased energy and acrobatics, flipped furniture, or missed bedtimes. We will, however, take credit for all the fun!